Waterval Boven is a small town situated on the edge of the Escarpment on the banks of the Elands River above the 75m Elands Falls on the railway line from Pretoria to Maputo in Mpumalanga, South Africa. Hence the name which means "above the waterfall" in Dutch.It is the sister town of Waterval Onder which is at the base of the Escarpment below the waterfall. Both settlements were established in 1895 because of the building of the Pretoria - Delagoa Bay railway line, built by the Netherlands-South African Railway Company .HistoryThe railway from Komatipoort to Pretoria reached Waterval Boven in March 1894. In order to establish a supply depot, The Transvaal Republic acquired about 78 ha of the farm Doornhoek, lying on either side of the line. 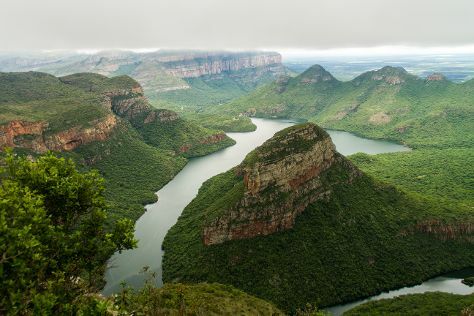 Between Waterval Onder and Waterval Boven, the line rises from the Elands River valley and the Lowveld to the eastern edge of the Highveld – 208 metres over a distance of 7.5 km – which necessitated a rack-railway and a steep, curving tunnel over this stretch. This route was later changed to a less severe gradient over a 14 km stretch with two tunnels. After this diversion, the old tunnel was used for road traffic until 1936, when the Elands Pass was built. The original tunnel, and also the bridge just below the tunnel, were proclaimed historical monuments. Waterval Boven is in Mpumalanga. With the Inspirock world travel planner, Waterval Boven and other destinations across the globe can be made central to your personalized travel plans.